This shredder does its job well, if used exactly as intended. However, my wife fed some bank statements into the CD/Credit card slot (a smaller slot next to the larger paper slot, both on top of the shredder) and the shredder jammed. Believe me, this is an easy mistake to make since the two slots are so close to each other. Beisdes, who would think that a mechanism that can shred CDs would have a problem with paper? Anyway, after clearing the jam, the shredder will no longer shred CDs or credit cards fed into that slot. (The paper slot still works fine for paper.) I contacted Fellowes and they refuse to repair or replace the shredder, saying that it was misused and the warranty does not apply. There is no warning on the shredder itself, nor in the user's manual, that putting paper in the CD slot will cause any problem, or will void the warranty. Me: My wife recently fed some old bank statements into the CD/CreditCard slot on our brand new model MS-450Cs shredder, purchased from Amazon.com. The paper clogged up the cutters, but I was able eventually to remove the clog by dismounting the shredder mechanism from the base and using needle nose pliers to pick out the paper, which had wrapped tightly around the shaft. However, the cutting blades had somehow become loose from the shaft and consequently the shredder will now no longer shred CDs or credit cards. It seems to me that the CD cutting blades should not have broken loose from the shaft under these circumstances. Can I get them repaired under your warranty? Carole: Thank you for contacting us. Unfortunately, this would not be a warranty issue. More than likely there is damaged strippers and not cutters. The strippers strip the paper (or material as it is being shredded) and feed it into the basket. If the strippers were broken, it can appear as though the blades are misaligned because the strippers are in between the blades. In addition, the further bad news is that we do not carry the internal components for this shredder. Me: This is not the response I expected from a reputable company like Fellowes. Are you saying that you are refusing to honor your warranty? It seems to me that the failure of these parts was very likely due to a defect in material or workmanship, which are covered for 1 year. It is not like we tried to shred a brick. We put paper in what turned out to be the wrong slot. There is no warning in the user's manual against doing so. In particular, nowhere does the manual say that putting paper in the CD slot will void the warranty. Has now stopped shredding all together. Checking to see how much it will cost to send to Fellowes...they deserve this piece of junk. Warranty not a factor, Fellowes offers no repair service nor parts service to repair this beast. Shreds into tiny bits, with fairly quiet operation. Owned probably 10 shredders and this is the worst I've owned. Normally love the Fellowes products, but not this one. Hard to get the paper to begin shredding, will only handle 4 sheets at the most and then it has a tendency to jam. Removal of the waste is difficult and I will guarantee that you will leave bits of paper on floor, ok lots of paper on floor. But, it does shred very tiny. Doubt anyone could put documents back together. I bought the MS-450Cs because it shreds smaller than anything else you will find at the consumer level. Shreds end up being about 1/2 the size of an unstapled-staple. Or if you are a levenger binder user, about the size of a chad. Really small. 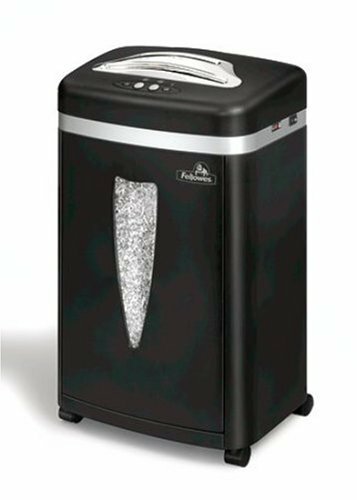 If you've been saving up your shred material for months, be prepared to shred in cycles as this shredder will heat up fairly fast (3-4 minutes continuous use). It has an automatic shut-down feature when it gets hot. The cool down doesn't take that long. After shredding the material that I had been saving for months, it has never heated up on me again with my everyday junk mail. I'd buy this again in a heartbeat!!! I bought this shredder after researching it online and reading the reviews. I have had the $30.00 shredder, too painful, too loud, too slow and too easy to see the info. even after I shredded it, this is true confetti, mulch like. I have no worries about data being left. It also zipped through CD's with no problem, I am confident this will be the only shredder I ever need. It's also incredibly quiet, which impressed me immediately. The safety feature is amazing, no way children can get in there, any fingers at all, it has a sensor that just won't allow this to happen. It's on rollers, so if you need to move it, no problem there. I highly recommend this shredder, especially if you want to be sure your checks, credit info, statements, etc. are completely destroyed. if you ship a lot or want to stay "green" it's a nice way to recycle. heating switch nor do I overload thickness size of 7 sheets at one time. anyone piece these together again!! Pros: Perfect Machine for my kind of use: I.E Mail,Bank Statements, Private Info Ect Ect. Yes, You Will Want to Shred Everything You Own! I felt like I was overpaying for this when I bought it (not here, for $200), but it even feels like a value at that price. My only complaint about the machine is that it does not live up to its advertised billing of a 7-sheet capacity. I think I can get seven sheets shredded if they are inserted exactly right, but it often balks. Still, paper tends NOT to jam, the opposite of every shredder I have ever used. The most it would take would be a gentle tug with some pliers and even the overload went right through. Considering I have spent literally hours unplugging some low grade models (the Office Depot Ativa comes to mind) this was really unbelievable. And all of the things that others are saying are true. It is SO QUIET!! I have never used a shredder while my daughter is going to sleep without disturbing her! And the microshredding is very easy to bag for recycling. The childproofing (and adult-proofing) apprears to work really well -- the maching does not work if a finger gets to close to it. 1. Data recovery. No one will be able to piece back together anything shredded by the MS-450C. Paper is simply shred that finely. Better than anything else I've ever seen. 2. Quietness. Perhaps I should've put this first. I can shred while my wife sleeps in the next room, something I never would have attempted before. Please, do your research, check opinions on other shredders, whatever you need to do. But you will come back to buy this model. Absolutely no bad things to say about it. The CD/DVD shredder part is actually a different feed than the paper shredder, a feature not seen on many machines. By that I mean not only is there a different slot, but it has a different method of shredding them. Unless you know someone is assembling your documents from your old strip cut shredder, stay away from these superfine shredders unless they have some sort of filtering system on them. You will have lungs filled with paper dust making a mask necessary, and your room will have a layer of paper dust all over it (possible fire hazard?). I can also see even more puffs of paper dust flying out the top slots every time I put the bin back in. My next shredder will not cut the pieces that small. The paper shredder's cutting cylinders stopped turning after about a total of a half hour of use; the motor continued to run. I sent it back to Amazon.